Key Personnel | Law Firm in Chicago, IL | Otubusin & Associates, P.C. 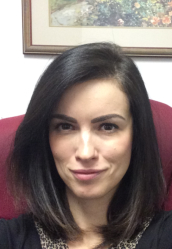 Laura Steponavicius is a Paralegal at the law firm of Otubusin & Associates, P.C. She serves as a point of representation towards the firm and aids the office manager and attorney. In addition, she also serves as point of contact person when the attorney is unavailable and assists the attorney during all stages of trial preparation and filing. Mrs. Steponavicius greets and welcomes every client and all other guests who do business with the law firm, ushers them into the principal’s office per their scheduled office appointment, answers telephone calls, and schedules all clients’ appointments for the firm. Mrs. Steponavicius is especially experienced in the following: organizational abilities, communication and computer literacy. In addition, she also carries out the duties of the following areas of law: initial client interview and intake, drafting of basic motions and affidavits, filing pleadings at both federal and state courts, and trial preparation. Mrs. Steponavicius studied Information Technology at Vytautas Magnus University, Lithuania from 2003 to 2004 and attended the National Open College Network (NOCN) in Northern Ireland from 2004-2005 where she received a certificate in Community Interpreting with a specialization as a Court Interpreter. Vesta Zavistauskaite is a Paralegal at the law firm of Otubusin & Associates, P.C. She serves as point of contact person when the attorney is unavailable and assists the attorneys during all stages of trial preparation and filing. Ms. Zavistauskaite is especially experienced in the following areas of law: personal injuries, medical malpractice, commercial litigation, bankruptcy, criminal law, divorce, real estate and wills and estates. More specifically in initial client interview and intake, drafting basic motions and affidavits, filing pleadings at both federal and state courts, trial preparation, appearing on behalf of the attorney (on court calls that do not necessarily require the presence of an attorney), and also in collecting on the law firm’s outstanding client accounts. Ms. Zavistauskaite received her B.A. degree in Psychology from the University of Illinois at Chicago and is currently the 2017 candidate for J.D. degree from IIT Chicago-Kent College of Law, Chicago. Dennis Okolie is a Book Keeper/Law Clerk at the law firm of Otubusin & Associates, P.C. He serves as point of contact person when the paralegal/office manager is unavailable and assists in the preparation of bills as well as all stages of trial preparation and filing. Mr. Okolie is especially experienced in the following areas of finance: preparing reports and analyzing variable expenses, tracking and processing of legal expenses, handling of the vendors PO and invoices, regular budgeting and forecasting. In addition, he also conducts research and responds to inquiries regarding billing issues and invoice payment status updates. Mr. Okolie received his B.S.C degree and M.S.C degree in Economics and Finance from Middlesex University and the University of Leicester (School of Management), respectively. He also holds a Project Management Professional certification. Carmen Otubusin is a Paralegal and Office Administrator at the law firm of Otubusin & Associates, P.C. Carmen is especially experienced in the following areas of law: personal injuries, medical malpractice, commercial litigation, bankruptcy, criminal law, divorce, real estate and wills and estates. More specifically in initial client interview and intake, drafting basic motions and affidavits, filing pleadings at both federal and state courts, trial preparation, appearing on behalf of the attorney (on court calls that do not necessarily require the presence of an attorney), and also in collecting on the law firm’s outstanding client accounts. Carmen received her B.A. degree in Theater from Columbia College, Chicago, Illinois in December 2016. She is a 2019 candidate for Master in Business Administration (MBA) degree from the IIT Stuart School of Business, Chicago, Illinois. Cozette Otubusin is a Paralegal at the law firm of Otubusin & Associates, P.C. She serves as a point of representation towards the firm and aids the legal assistant in her daily tasks. Ms. Cozette greets and welcomes every client and all other guests who do business with the law firm, ushers them into the principal’s office per their scheduled office appointment, answers telephone calls, and schedules all clients’ appointments for the firm. In December 2015, Cozette received a B.A. degree in Criminology, Law and Justice from the University of Illinois at Chicago, Illinois. She is a 2019 candidate for Juris Doctorate (JD) degree from IIT Chicago-Kent College of Law, Chicago, Illinois.